Scaffolding has been removed from Victoria Gate - Valletta's oldest gate - as a restoration and rehabilitation project which has been ongoing for months, enters its final phase. The gate, built by the British in 1884-85, has been undergoing restoration and a much-needed clean-up by the Resources Ministry. The gate was designed by Emanuel Galizia and named after Queen Victoria. It replaced the single arch Marina Gate built at the time of the knights complete with draw bridge. The need for a bigger gate had been felt because the area of Marina Street down to the harbour was, at the time, the busiest part of Valletta. Ships used to berth close by, bringing produce from Italy and Gozo, and the shops which lined Marina Street used to be a hive of activity, with wholesalers supplying the other shops in Valletta. The area also used to boast many bars. The rebuilding of the gate also saw the gradient of Marina Street being lowered - as can be seen from the lowered doors of the surviving shops. The rehabilitation of Victoria Gate included the removal of old fixtures and repairs to the stonework. The pavements along the street are currently being widened and repaved. The Resources Ministry is planning to eventually give new life to this part of Valletta - now a shadow of the past - by introducing tourist amenities and facilities such as cafes, souvenir shops, restaurants and information offices, and restoring the old historical features - such as the old awnings which used to line the street. 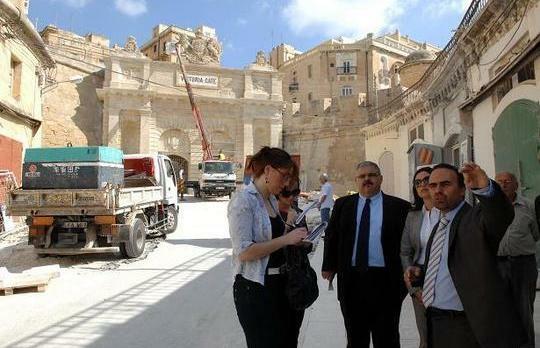 In that way the street may become an attractive walkway from the cruise liner terminal to the heart of Valletta. The project will also include the rehabilitation of the tunnel under the bastion at the bottom of the hill. Valletta Local Council in a statement welcomed the restoration of Victoria Gate, sayign the project would help breathe life into the area. It said that residents had been scared of going out at night in the area but with the recent upgrade, the area "will not only shine in the morning but also in the evening." "What was before a dull area is now being turned into a model for other parts of the city and the harbour area," Mayor Alexiei Dingli said.